On July 1st 1862, President Abraham Lincoln signed the first Pacific Railroad Act, creating the Union Pacific (and Central Pacific), and authorizing construction of a transcontinental railroad to span the vast territory from the Missouri River to the Pacific Ocean. 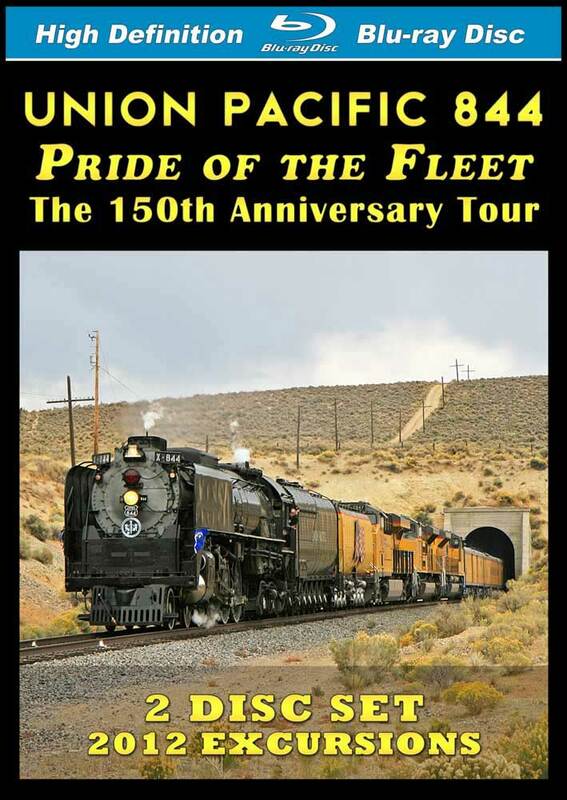 In 2012, the Union Pacific marked its 150th anniversary with a yearlong celebration of special events. This was also the busiest year to date for the Steam Team, as locomotive #844 traveled over much of the UP system in her role as goodwill ambassador. This 2 DVD set covers a number of the 2012 excursions. 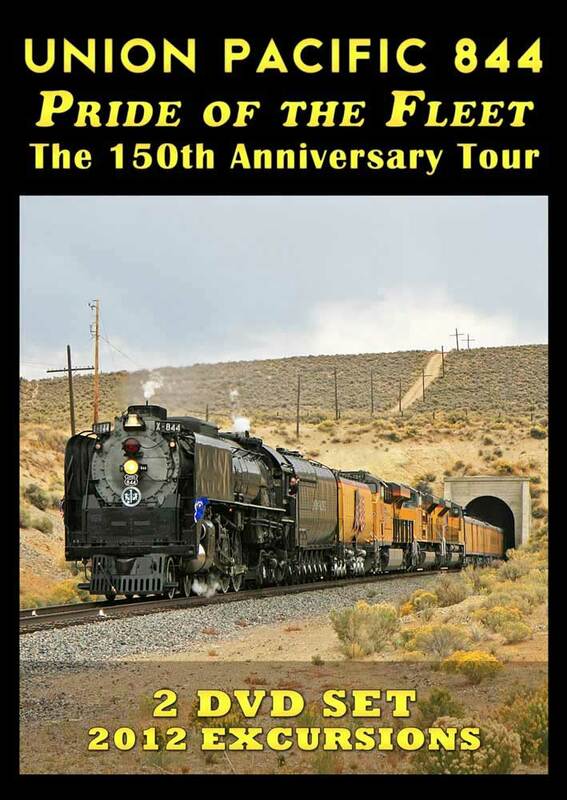 On Disc 1, you'll see coverage of the March 22nd & 23rd ferry moves for the �Shiloh Limited� excursion, as #844 travels from Cheyenne, WY to Council Bluffs, IA. Most 2012 trips were dubbed the �UP 150th Express� and the first on this disc is a Cheyenne to North Platte, NE jaunt on June 8th. Next up is an extensive segment on the annual Cheyenne Frontier Days Train, with all 3 days of operation covered (July 19th, 21st, 22nd), plus unreleased footage from the 2011 train. Disc 2 starts with some rare mileage on the Yoder Subdivision, as #844 heads to the Nebraska State Fair on August 30th. Next you'll see #844 on September 17th as she returns to Cheyenne after spending the weekend at the annual North Platte Rail Fest. A trip to Sacramento, CA follows with coverage of the first 3 days of travel, as #844 races from Cheyenne, WY to Elko, NV in late September. Finally, we reunite with #844 in Ogden, UT for the 2-day return trip to Cheyenne in October. Filmed entirely in HD, this 2 DVD set features high speed running and great stack talk amidst western scenery. This program has minimal narration (with the option to turn it on or off) and no distracting music. Total running time is 181 minutes.